I love Not Me! Monday! But first, I have to tell you something. I think you all know by now that Not Me! Monday! was created by MckMama, but if you have not visited her blog, I encourage you to do so. Her youngest is a little boy named Stellan who is four months old. In the womb, he had serious heart problems and the doctors told them that sweet Stellan would not survive. This launched a huge prayer movement, and by the hand of God, baby Stellan was born alive and completely healed. A true miracle. Over the weekend, Stellan has begun having heart problems again and is in the Pediatric Intensive Care Unit at Children's hospital by where they live. This is a total shock as no one saw any problems with his heart after his birth. Please pray for Stellan and his family, and Click Here to visit MckMama's blog and get the updates. OK, now onto Not Me! Monday! 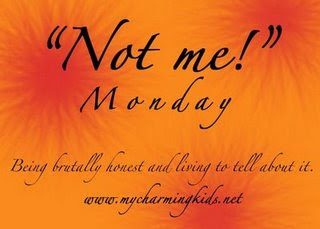 I did NOT forget to start my Not Me! Monday! earlier in the week, leaving me to try and remember last week with clarity. I am NOT having such a hard time that it is now 9pm and I haven't finished. I am NOT so lame that I can't remember the actual wording I was going to use to describe how Ben did NOT try and feed the cat from his fork at the table, and lean too far over and fall out of his booster seat and land on his head. I did NOT find a funny way to describe my son's injuries, and I certainly did NOT forget the funny. I will NOT remember that wording about 27 minutes after I finally give up and post this. I do NOT have several pictures in my camera that will make for great blogs, but have not blogged about them because I have not taken the time to upload them. I am NOT so concerned about the condition of my computer that I am wanting to hold off uploading pictures in case 30 new pictures become the straw that break the computer's back and the whole thing explodes in a ball of seven-year-old-computer-flames and sends it's doom into the USB cable and destroys my favorite camera in the whole world as well. No, I am NOT so insane as to think it is possible for that to actually happen. Sheesh. Hey Tiff, I was talking to Holly today and told her about a friend of mine who said that you can order your blog on a book. She then told me about the book that Marty made for you. Very sweet I did however hear about the typo but mum is the word. I will ask her about it b/c you have some great memories about your life as a very busy mom of young ones and someday you will want to go back and remember the chaos it was. Let me know if you are interested.